For the first time ever in my life, I visited Crufts this year. Apparently no-one at work can believe it was my first time, so I’ve clearly been pegged as the token ‘crazy dog person’. Although I had my doubts after the Pedigree Dogs Exposed programme, I really enjoyed it. Obviously the more extreme breeds are not going to change overnight, but most of the dogs I saw appeared to be happy and healthy. 1) Weekdays are better than weekends for shopping I did my rounds of the hundreds of dog stands in the five halls on Friday and I was glad I did. A) It got all my essential shopping out of the way (Rory needed a new harness for going running, but perhaps not the dog tea bags I picked up) and B) It was actually possible to browse. On Saturday, it was heaving with people. Even getting around when you knew where you wanted to go was a challenge. 2) So point one, actually leads into point two – two days are better than one. 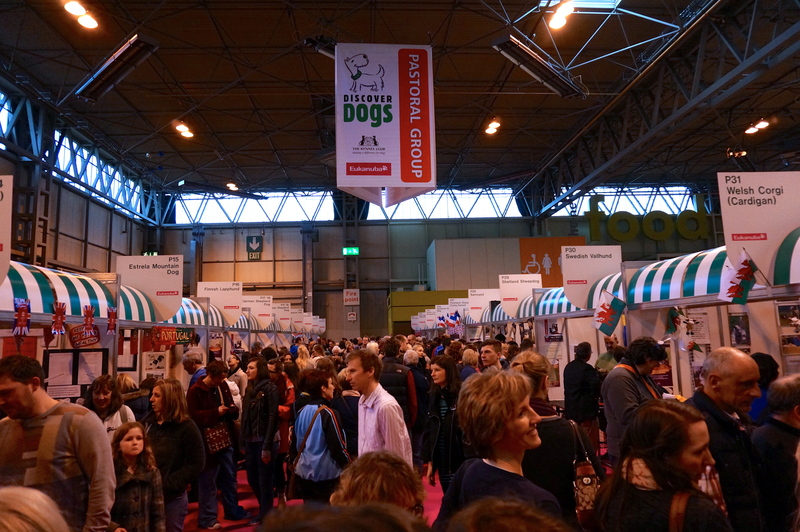 Crufts is big, really big. In two full days at the show, I saw almost nothing in any of the show rings. There is so much going on all the time, from obedience trials and agility, to heelwork to music and Guide Dog displays, and they are not all in one place. Even if you are lucky enough to have two days, I’d recommend planning what you absolutely can’t miss, what you’d quite like to see and what you are not bothered about. Then if it’s on the ‘must see’ list, start moving to the ring well ahead of time to allow for people congestion and finding a seat. 3) Think temperature control! The NEC has very high ceilings and I found I was either boiling or freezing. I’d recommend wearing layers and, while we’re talking about dress code, sensible shoes. Unless you are planning on sitting in the main arena all day you will do a lot of walking backwards and forwards. 4) Watch out for dog wee! And worse. There are a lot of dogs all in one place who, as I understand it, are only allowed to toilet in small sawdust areas around the edges of the halls for most of the day. Accidents do happen, I even had to dodge one male dog who was weeing out of the side of his crate as his owner was pushing it along. Just something to be aware of. Don’t just merrily walk through that ‘dropped drink’. 5) It’ll ruin most other dog shows for you. I like to compare it to the Toys R Us advert that promotes ‘everything under one roof’. If you like any aspect of living with a dog, if you enjoy watching canine sports, if you like doggy shopping or you just like looking at good examples of different dog breeds, there will be something for you. No other dog show can compare. Five things I learnt from my first Crufts | Live. Love. Learn. Write.